New Day for Children believes that no child should go without food. 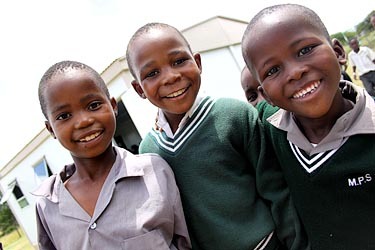 The children that have been orphaned by HIV/AIDS deserve the opportunity to not only survive but to thrive. By providing hungry children with a meal every day, we seek to provide for their most basic needs. Through enabling the older children access to higher education, we seek to provide these children the life skills and trades necessary to become responsible adults and provide for themselves, their families, and society as a whole. Through the establishment of Neighborhood Care Points, we will provide a daily meal to the orphans and vulnerable children of the rural communities. These Neighborhood Care Points also serve as a center of learning to teach young orphans the needed language and socialization skills. By providing scholarships to technological colleges, we equip the orphans who have graduated from high school with a trade. They are then prepared to enter the work force with a true skill, as an electrician, accountant, teacher, mechanical engineer, automotive mechanic, as well as many other trades.